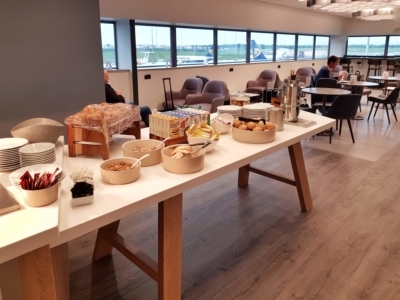 This is our review of the Aspire Lounge (South) at Birmingham Airport. 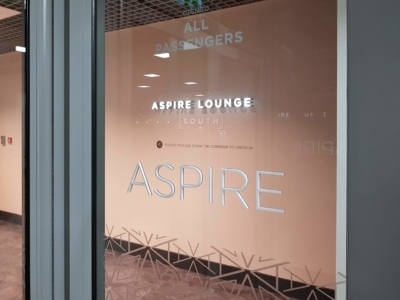 We wrote about the opening of the new Aspire Lounge at Birmingham Airport a few weeks ago. This is the 2nd Aspire lounge at Birmingham and is at the south end of the terminal. Two readers, Phil and Craig, sent us reviews whilst reader Nick sent us some photographs. As it seemed a shame to waste any contributions, we have run both reviews and added in some of Nick’s pictures as well. The photos are mixed so some of Craig’s are in with Phil’s text and vice versa. Thanks to all three of you. All of our UK airport lounge reviews can be found here. 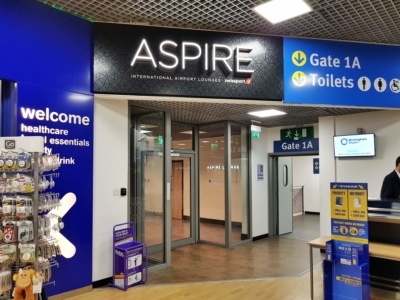 “The new Aspire Lounge itself is located in the satellite terminal at Birmingham, where gates 1-20 can be found. This is, generally, where Flybe and Ryanair flights depart from, so makes for a convenient location to relax or work before a flight. When walking to the lounge you pass by the large Aspire lounge in the main terminal. Keep walking and the Aspire South lounge will be right in front of you. As the lounge is supposed to open at 4:30am, finding the doors to the Aspire South lounge locked at 7am was a bit of a surprise. It turns out that Aspire was short on staff that day and it was half an hour before someone arrived from the main lounge to open up. Once the doors were opened, the lounge itself was surprisingly spacious. Expectations were of a compact lounge with minimal facilities, but Aspire has made good use of the space. There were two seating areas, split by the buffet section. Both are broadly similar, with table seating in the middle, smaller cosy chairs around the edges, and a bar-style area around the perimeter. Pleasingly, any place near a wall had a power and USB socket available, and often more than one. The side nearest reception offers views across the airport apron, while the far side has a more restricted view. Neither is a great place for plane watching, but there’s plenty of light through the windows. Artificial light augments that, but it’s warm rather than stark. Still, it’s probably not a place to try and take a quick snooze. 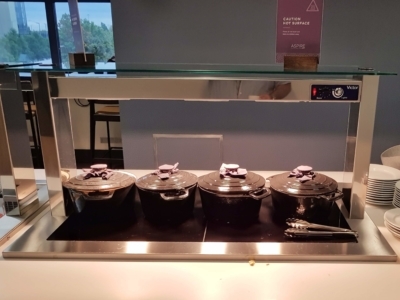 The buffet area offered the standard Aspire fare, so my breakfast visit meant bacon, sausages, scrambled eggs and beans. It was all just about acceptable, although the cheap, vinegary condiments provided were low quality. Tough croissants and a selection of fruit, yoghurts and cereals were available too. Coffee was self-serve from one of two machines, one of which was out of order. Soft drinks could be poured from a fountain, with a fully-stocked bar offering other alcoholic drinks to order. Prosecco was available at an additional £4.99 a glass, or £12.99 for the bottle. As with many other lounges of this nature, there were no washrooms available. These were instead located almost immediately outside, but down a flight of stairs. There were no newspapers to read either, although this may have something to do with the rather late opening. There was an uninspiring selection of magazines, including the Royal Liverpool Golf Club magazine, Stylist, and Business & Professional. Also notable by their absence were staff – there appeared to be just one member of staff covering everything, which may go some way to explain why opening was delayed. However, no explanation or apology was offered. “The new lounge is only 100m from the existing facility and other than being sparkly and new is pretty similar. I gained entry with my HSBC World Elite card via LoungeKey. First impressions: the “ring the bell to get in” sign implies it is not busy and, as I was only the second person in the 80+ capacity area, it certainly is not. Entry is quick and the staff member told me that it does get a lot busier towards lunch time. 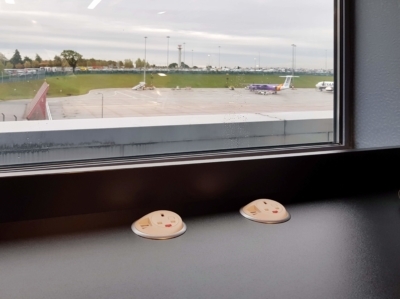 There are many windows which – whilst it was dark when I visited – will make the space pleasant and give views over the Ryanair side of the terminal. It is a single rectangular space with a variety of seating but no privacy. And it is QUIET. The sort of quiet where my fellow traveller scraping his spoon on his bowl is deafening. When the cooler motor turns off the silence really kicks in and it is like sitting in an exam hall, not a good feeling. Food is just OK. I much prefer Aspire to the No.1 menu system which allows one menu item per visit. In Aspire if you want to be greedy (like me) you can have bacon and eggs AND a bacon roll! The drink selection is pretty standard though they have installed a serviced bar for alcohol unlike the “help yourself” fridge in the other lounge. Two ‘bean to cup’ coffee machines and a chilled soft drinks tap complete the line up. There are plenty of plug sockets including USB charging. 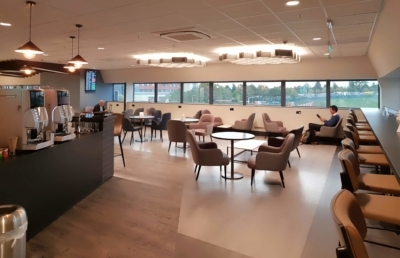 Thanks Craig.You can access the new (and indeed the old) Aspire lounges at Birmingham Airport for free with a Priority Pass (which comes free with American Express Platinum, or you can buy one separately). It is also part of Lounge Club, and you get two Lounge Club passes for free with the free American Express Preferred Reward Gold credit card – plus 20,000 Avios if you convert your sign-up bonus! World Elite Mastercard holders – which mainly means HSBC Premier customers – can also get in via their LoungeKey cards. Alternatively, you can pre-book for cash via the Aspire website. I suspect that’s not helped by the lack of soft furnishings / carpets and acousticceiling tiles. A lot of interior design in airports these days seems to involve hard tiled floors and concrete walls plus large pane windows. All fine in moderation but combined with a lack of soft coverings, theres nothing left to absorb noises. I wish they would open a second lounge at MAN T3 as this is often overcrowded, or better still allow those with PP to use the 1903 lounge for a supplement. 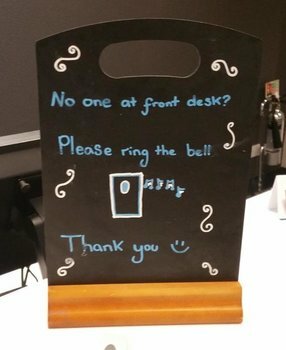 I would be happy to pay even though I get access to the BA lounge. Even a further lounge or two at each of Stansted or Luton would be a great help and introduce some competition. MAG seems to be squeezing out third party lounges so I reckon Stansted is more likely to see a 1903 lounge which won’t be in Priority Pass but which the long haul carriers would use. If Birmingham can have two Aspires (and a No 1 Clubrooms too soon) then I agree Luton could do more. Thanks for the reviews, very useful and timely as I will be flying Ryanair from BHX on Thursday. Has anyone been in this lounge later on in the day and can comment on the food? We’ll be there about 6pm or so. DragonPass lists the main lounge but doesn’t yet mention the new south lounge. I’m pretty sure it would be accepted there too. We visited on Friday morning around 5am only to find the doors locked also – but didn’t see a sign so went to No1 instead. A long walk to get to the smoking area (for those who do.) The original Aspire lounge is much more convenient. Thanks for the reviews. Sounds like a decent place to catch up on some and grab some breakfast before a flight. I quite often use Flybe from BHX so this is a welcome addition and will try in a few weeks. The lack of in-lounge toilets is annoying and the same across all the paid lounges (I’ve not been in the Emirates lounge – which, by the way, I would be happy to review in return for a J ticket to Dubai ???? ).